← Why have travel insurance? Gubbio is a modest town in the north of Umbria. There is no convenient way to get there and its remote position has kept it intact and authentic. Gubbio is nestled into the side of Monte Ingino in the Apennines not far from the western border of the Marche region. The town itself displays a rather independent air, as if giving testimony to its history of being somewhat set apart. 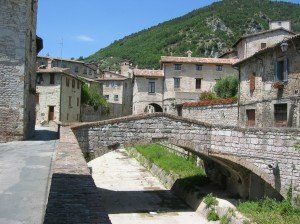 Although a few tour buses now stop there, and some independent travelers make their way to the town, Gubbio is still not on the casual tourist’s “must see” list. 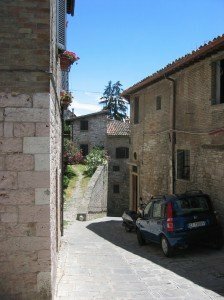 You will be hard pressed to find a more unspoiled town in central Italy. The majority of the town is medieval, although there is evidence of Gubbio’s history dating back to the Bronze Age. Just outside the city walls there is a substantial 1st century BC Roman amphitheater. A Roman mausoleum is located just a stone’s throw from the amphitheater. It is listed on Gubbio’s tourist maps as belonging to the Roman consul Pomponius Graecinus, although there is nothing more than coincidental evidence to substantiate that claim. The Italian way of preserving and honoring history is clear and evident throughout Gubbio. On our first visit to the town my wife and I passed a public works sewer project along the via dei Consoli. Ancient foundation walls had been uncovered below the the road surface. A young woman, who turned out to be the project archeologist, was standing nearby. “Romano?” I asked, in reference to the unearthed stones. “No, medioevale” she replied. Workers were in the process of carefully cleaning, documenting, and photographing each pile before they could be buried once again and capped with rounded paving stones restored to their original pattern. The work appeared to be progressing slowly. This is the sort of procedure that must be followed when any antiquity is discovered in any project in Italy, whether public or private. Work must stop; archeologists must study; plans must be drawn; every detail noted. History must be preserved and protected; even the history of medieval stones that will not be seen again until future sewer repairs are necessary. Is this the fastest and most efficient way to expedite construction? Of course not! It is the Italian way. 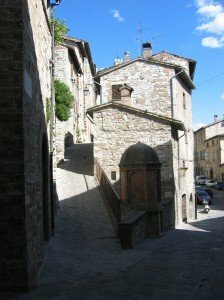 Also along via dei Consoli are some of the best examples of one of medieval Gubbio’s most puzzling mysteries, the Porte della Morte, the “doors of death.” One could easily pass right by them if not alerted to their presence. The “doors of death” are narrow bricked-in openings usually very near and slightly above a home’s main entrance. 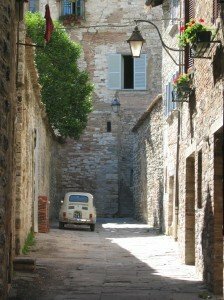 They are rare architectural features, found only in a few places in Umbria, Tuscany and the south of France. Their name comes from the most popular, although unlikely explanation of the doors’ purpose. Legend has it that they were used only for carrying out the coffins of dead residents and then sealed again – a very romantic notion, but their primary purpose was probably much more pragmatic. In case of an attack the larger main entrance could be barricaded and the narrow opening, usually leading to a very tight staircase, would be much easier to defend. As is usually the case, superstition provides the more appealing narrative. Just off of via dei Consoli is the medieval police station, the Bargello, and next to it the Fontana dei Matti – “The Fountain of the Mad.” The legend claims that if you walk around the fountain three times you will lose your mind. Presumably every teenager in Gubbio has tried this at least once and it is also a temptation too great for many visitors to resist. I was not tempted in the slightest, seeing no reason at all to push my sometimes shaky luck. Towering above the town, near the summit of Monte Ingino, is the Basilica di Sant’Ubaldo; a monument honoring Gubbio’s patron saint. There are two ways of getting to the Basilica; either via a steep and winding footpath which leads up the mountainside from behind the duomo, or by a precarious ski lift-like contraption that is very reminiscent of either a string of dangling human bird cages or some form of medieval torture device. Gubbio is renowned for one great annual event, the Corsa dei Ceri; a foot race up the mountainside to the basillica that has been conducted each May for nearly a millennium. The Corsa dei Ceri is no ordinary foot race. 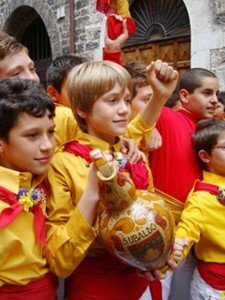 It is a combination civic celebration and religious procession with a dose of carnal fertility rite thrown in for good measure. It is second only to the famous Palio di Siena in the pantheon of popular Tuscan and Umbrian festivals. The Ceri are three large priapic, wooden columns topped with effigies of Saints Ubaldo, Antonio and Giorgio. The carved Ceri are four meters high and very heavy. During a procession through the town the Ceri are raised to their erect position accompanied by a chorus of excited cheers from the crowd. There is an entire day of various celebratory stops and feasting, and then the race begins. Three teams of ten men, which can be replaced every ten minutes, race up the mountain path to the Basilica carrying the Ceri. Of course, the Cero of Saint Ubaldo always wins. One of Saint Francis’ most dazzling animal escapades is supposed to have taken place in Gubbio. As the story goes, an enormous marauding wolf was terrorizing the inhabitants of Gubbio; devouring livestock and townsfolk alike. Attempts to kill the animal usually ended up with the brave hunters becoming the piatta del giorno for the fierce carnivore. The situation became so bad that few people dared to venture out beyond the city walls. Francis, who was living in Gubbio at the time, was well-aware of the town’s plight and decided to intercede. In spite of many exhortations to stay within the walls, Francis headed out into the surrounding wilderness in search of the animal accompanied by a small group of comrades. All but one of his supporters eventually turned back in fear. When Francis finally found the wolf, or perhaps vice versa, the animal was poised to attack with jaws opened and fangs bared. Francis made the sign of the cross and admonished it: “Come to me, Brother Wolf. I order you in the name of Christ not to hurt anyone!” The animal immediately closed its jaws and laid down at Francis’ feet. Francis then formed a non-aggression pact with the wolf who placed his paw into Francis’ hand as a sign of agreement and followed the saint back into town. The townsfolk were astonished by this exhibition of the power of God and vowed to feed and care for the wolf for the rest of his days. The animal subsequently lived among them in peace. Not even the dogs of Gubbio barked at him. The town was grief stricken when the wolf finally died of old age two years later. 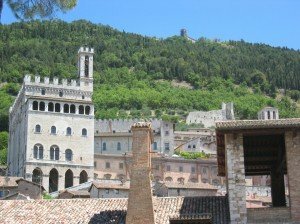 Mysterious Gubbio – so much to discover, but where does myth leave off and history begin? I heard a rumour that the bones of an extremely large wolf were found beneath one of the town’s smaller churches. I only hope it is true!